Def Leppard singer Joe Elliott has once again mentioned the bands plans to tour the UK in Spring 2015 to promote the next studio album release. Joe has repeated his mentions of a UK tour to coincide with the planned 2015 Spring release date for the next studio album. Joe last mentioned the plans in an April Planet Rock interview. Vivian also hinted at UK dates back in March. The 'Hysteria' rockers are busy working on new material, which they hope will be ready in time for next spring and are planning to support the record's launch with a UK tour. 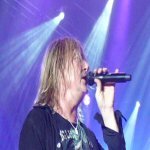 Taking to 'Planet Rock Stock' Main Stage, frontman Joe Elliot said: ''We've been working on and off on a new Leppard record. We're just extremely flattered that people care enough to want us to keep making new music so hopefully we'll have a new album out for next spring.